Paul Neurath's new studio, Otherside Entertainment, is working on a spiritual successor to Ultima Underworld. They just started a Kickstarter campaign for Underworld Ascendant, and I would recommend all LGS fans check it out. Edit: They promised one if they reach 750,000 $, so I took the plunge and pledge for this project. My first! Woohoo! End of edit. Edited by Tels, 06 February 2015 - 07:06 AM. wasnt arx fatalis also some sort of spiritual successor? it looks like we are coming in an era of mass founded spiritual successors and that is a good thing. because many good games never had real successors. I think four of the team members are those who worked on Thief games. Tim Stellmach and Steve Pearsall are on board, which is kind of big deal. Warren Spector and Austin Grossman are consulting too, bringing the Looking Glass ties to six. This game should be very LGS like, and should be awesome. At a million bucks, they release a Builder Toolkit too, which I think any Thief or TDM fan can appreciate. So don't be afraid to pledge up a bit. I went in at the $50 mark, which gets you access to the alpha when it's available. I reached deep into my pocket and pitched in with $100. This is the second game I supported with this kind of money after Grimoire. Looks like the best shot at creating a LGS successor company. I'm very happy to hear that Underworld Ascendant will feature Stephen Russell. Russell's performance as Garrett is probably my favorite game character ever. His perfect delivery always manages to make me chuckle! It’s our pleasure to announce that Stephen L. Russell will be doing voice acting for Underworld Ascendant. Among gamers, Stephen is perhaps best known as the voice of Garrett in the original Thief games. At LookingGlass we worked closely with Stephen, where he voiced some of the more memorable characters from Thief, Thief II and System Shock 2. Stephen also did voice acting for Fallout 3 and Skyrim. We’re looking forward to working with him once again. Edited by Mr. Tibbs, 15 February 2015 - 09:18 PM. Ya. This is great news. So that's the face to the voice. First time i see him. And yeah, the man rocks. Will he play the Avatar? 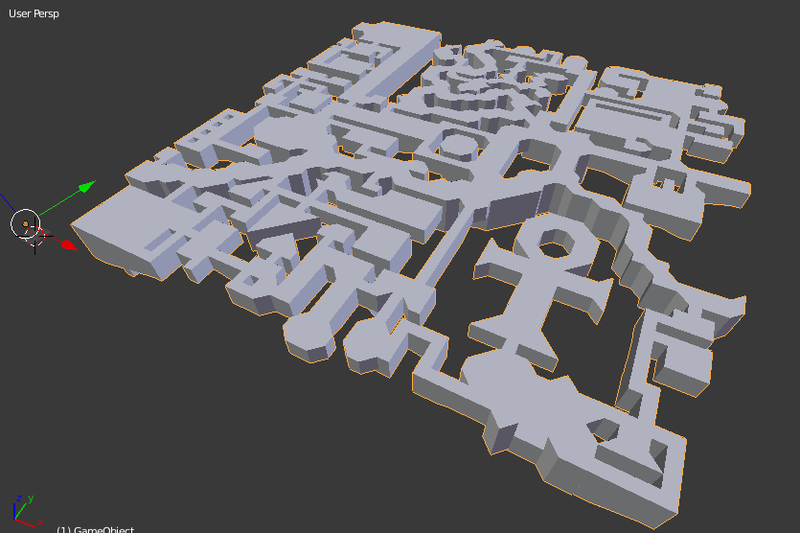 I was wondering how long it'd take me to extract the original Ultima Underworld level geometry. Answer: not long. Underworld snagged Terri Brosius, too! Edited by Mr. Tibbs, 17 February 2015 - 12:03 AM. So that's the face to the voice. First time i see him. Edited by brethren, 17 February 2015 - 12:17 AM. It really seems like they're getting a lot of the old crew back together which is incredible. If the game is successful can we expect some re-imagining of other former Looking Glass titles like System Shock and Thief? Say yes... please. We've discussed other plans, but all of our focus is on Underworld now. So it's entirely possible that their next project may be a Thief based one. Maybe in their funding they even include the cost to obtain a license from EM, or hell maybe they collaborate with EM and show it how it's all done! Edited by Goldwell, 17 February 2015 - 06:26 AM. The current Kickstarter seems to be crawling to the finish, but I think they'll get there. I wonder how a Thief Kickstarter would do - seems safe to say it would fare significantly better. Good question actually. I'd think the target audience would be equally... erm... small. But then, they'd probably have to purchase the rights, right? maybe because there is thief 4. and maybe spiritual successor in this case would not be so much success. Edited by Noordung, 17 February 2015 - 01:49 PM. Wouldn't need the rights for a "spiritual" successor. It would be something along the lines of TDM. I'm guessing they're starting with Underworld because that's where their roots are. It seems like a good possibility that if all goes well, Thief or System Shock (spiritual or otherwise) could be next. Edited by brethren, 17 February 2015 - 01:48 PM. It's a great game, but sometimes i miss a real campaign. I know, there is one in the making, and i'm sure it'll be great, but imagine 18 missions in a really good successor. With a good story of course, like in the original Thief games. @ brethren: That'd be great. There still seems to be a market for real stealth games, as Dishonored, Deus Ex Human Revolution and some others show. I'm sure they'd have to make it a bit casual though, to conform to the actual market. Edited by chakkman, 17 February 2015 - 01:50 PM. Is there a topic about this campaign WIP? Story or something? Personally I would like them to create something new rather than just a spiritual successor. With Underworld Ascendant they can at least use all the lore and story from the previous Underworld games except the Ultima name thus making it a true sequel. There's supposed to be a Thief class in the game - it'd be pretty cool if they made the game both a true sequel to Underworld and a spiritual sequel to Thief. Light gem, anyone?